A flicker of light, under cover of darkness—an uncertain chiaroscuro—figures emerge from the ambiguity of night in order to move so strangely it feels like Nosferatu is afoot. Helen Herbertson’s new work, Delirium, explores and presents that state which is in between, neither awake nor asleep, a state represented very differently by Kubrick in Eyes Wide Shut. This is less a landscape of fantasy than a strange land inhabited by strange creatures. These figures wear translucent black and move in a very odd manner. Their hands recite a mantra of weird and wonderful shapes. 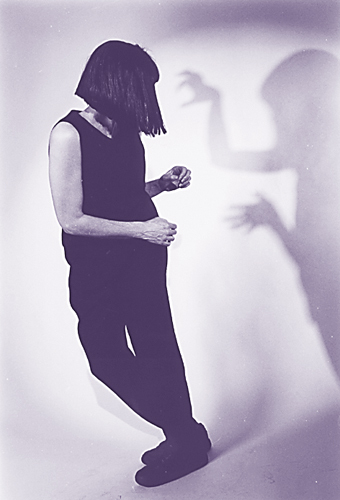 Herbertson performs a dance in a square space, lowering herself to the ground whilst mobile slits of dusky smoke appear then disappear. The movement of the 2 performers—Herbertson and the versatile, nay virtuosic, Patrick—is revealed and concealed by myriad lighting gestures; a shuttered square of black, a layer of darkness which is peeled away, rippled flesh partly revealed and partly concealed. Patrick performs his movements with fluid precision and a temporality which is other-wordly. Delirium is a collaborative piece, theatrical (Jenny Kemp), physically complex (Simon Barley), lit by the mind’s eye (Ben Cobham), buoyed by sounds both surreal and ordinary (Livia Ruzic). It sustains itself within a precise groove, turning and rotating its ideas, representing movement which is almost pixilated. Is it all in reverse? Moments of Delirium pass like those tiny notes in sheet music which you play as quickly as you can. This piece is not like others.